Allogromiid foraminifera and gromiids constitute an important but poorly known component of the meiobenthos in high-latitude marine settings. 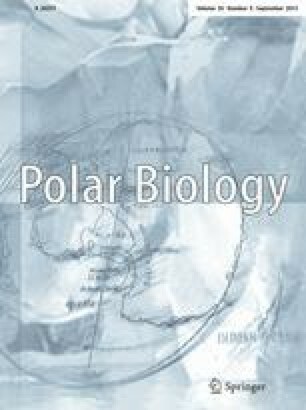 Here, we present a first report on the diversity of these protists, together with an account of co-occurring invertebrate taxa, in a sample of sea floor sediment from a water depth of 923 m under the Ross Ice Shelf. Light microscopy of sieved sediment yielded 14 allogromiid foraminifera and three Gromia spp. morphotypes. We also obtained 36 partial small subunit rDNA sequences of allogromiids, including 19 sequences of individual isolates and 17 sequences from environmental DNA samples. Phylogenetic analyses of the obtained sequences identified 18 phylotypes, of which seven were closely related to previously sequenced allogromiids, while 11 represented new lineages. Our results demonstrate that a rich meiofaunal assemblage is present under the Ross Ice Shelf, 12 km from the open ocean. Molecular phylogenetic analyses of these allogromiid foraminifera point to the endemic character of the Ross Ice Shelf assemblage; however, more extensive sampling of the molecular diversity of this group of foraminifera in the Antarctic deep sea is necessary to confirm this conclusion. We are indebted to the K-042 team, especially A. Pyne, field leader, and the AWI hot water drilling group, E. Dunker and U. Nixdorf, for ice shelf drilling and sample collection. We thank the staff of the National Science Foundation and Raytheon Polar Services Corporation for field logistics, Dr. S.P. Alexander for help in collecting the sample, and C. English for technical assistance. The Wadsworth Center’s Molecular Genetics and Electron Microscopy Cores, and NSF grant DBI-0116551 in support of the Center’s SEM facility are gratefully acknowledged. This study was supported by grants from the Swiss National Science Foundation (3100A0–100415 awarded to J.P.) and the United States National Science Foundation (OPP-0003639 awarded to S.S.B. ).